My family got our first computer back in 1990. It was a Tandy 1000HX that was already out of date when we got it. It worked well for what I wanted to do with it, but by 1993 it was woefully underpowered. Around that time my uncle gave us his old computer. It was a PC XT clone with an EGA monitor. It wasn’t a very big step up from my Tandy. But unlike the Tandy, this old XT was easy to upgrade. That was how I ended up with a Frankenstein 386. I played with our new XT computer for a couple of weeks before it broke. We took it down to a place called Computer Consignment. I took one step in and I was in heaven. So many old computers and computer parts. It was awesome. What wasn’t so awesome was the diagnosis. Our new computer had a problem with the motherboard. It needed the electronic equivalent of a heart transplant. My dad had just started law school, so we couldn’t afford anything too spiffy. But he needed a word processor, so we got it fixed. And even though it wasn’t top of the line, we did get an upgrade. The guys at Computer Consignment put in a new motherboard with a 386 processor and a full meg of RAM. This was a big step up from my old Tandy. One of my favorite movies as a kid was a Tom Hanks comedy called “The Money Pit”. It’s about a young couple who buy a giant mansion for cheap, only to find out that virtually everything needs to be replaced. That was the way it was with our 386. Not long after replacing the motherboard, the hard drive failed. We got a much bigger drive installed, thought unfortunately, its beige faceplate didn’t match the rest of the case. That was about the time we started calling it a Frankenstein computer. 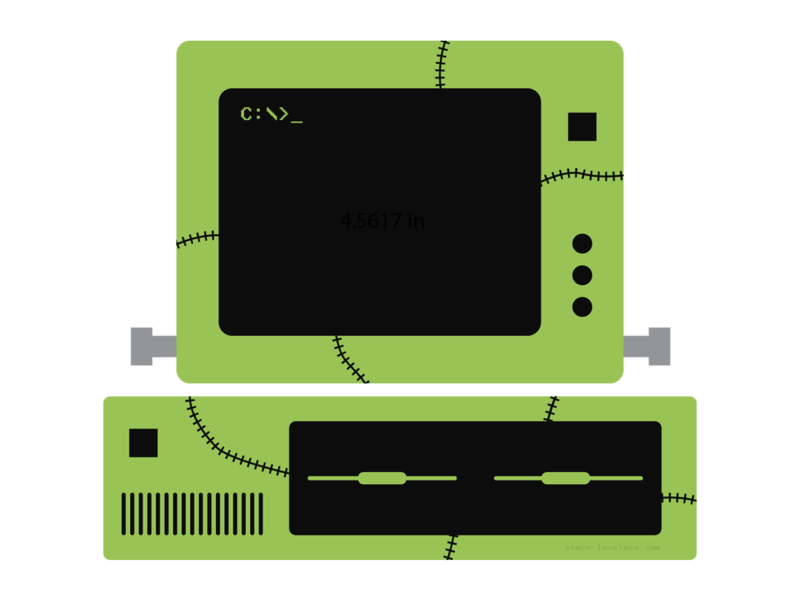 Like Mary Shelley’s unnamed monster, our Frankenstein 386 was pieced together from cannibalized parts. We continued to upgrade our Frankenstein machine whenever my parents had the money. We got a Super VGA card and monitor and installed Windows 3.1. Even back then, I was really into computer interfaces, and I spent hours just customizing the Windows color scheme. Still, I mostly used MS-DOS applications, like QBasic and a variety of DOS games. Overall, it was a pretty cool computer, though it wasn’t hip enough to run the upcoming Windows 95. But by then, I had become fascinated with Apple products, so when our Frankenstein 386 got too old and slow, we replaced it with a Mac. But that’s a story for another time. Do you remember your first (or even second) computer? Feel free to reminisce with me in the comment section.